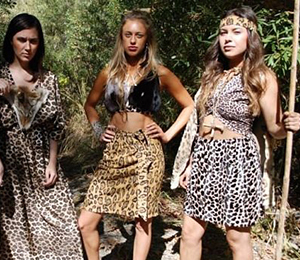 When a tribe of cavewomen imparts cruel justice on one of their own their fate takes a turn for the worst. After discovering and falling in love with the corpse sacrificed by the girl-gang, a lone wandering giant of pre-historic mythos is inspired to homicide. Consequently the cavewomen are menaced by the heartbroken and bloodthirsty cave-brute with a grudge, and the prophetess among them is ignored when she predicts the tragic outcome. 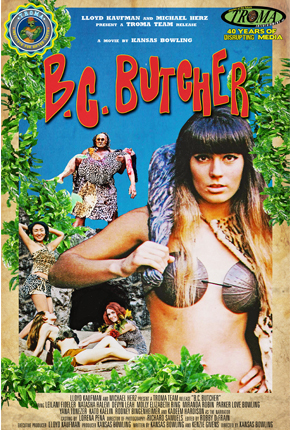 “BC Butcher” is hailed as the first pre-historic slasher film to ever be made. Shot on brilliant 16 mm film, the film features actor Kato Kaelin, a cameo from Rodney Bingenheimer of KROQ Radio and a performance by Southern California rock group “The Ugly Kids”. "It's if Russ Meyer directed the Monkees!"